The men of Lambda Chi Alpha believe in contributing to our community and serving the needs of the less fortunate. 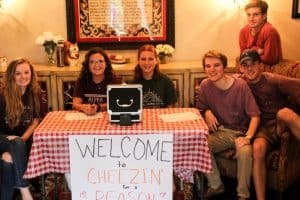 Our cheesin for a Reason fundraiser is one example. 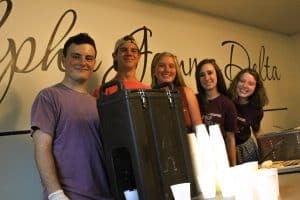 Each fall, the men of Lambda Chi Alpha pair up with the ladies of Alpha Gamma Delta to raise money for Feeding America. The Feeding America network is the nation’s largest domestic hunger-relief organization, working to connect people with food and end hunger. Originally founded in 1979 as a clearinghouse for national food donations is now the nation’s largest domestic hunger-relief organization—a powerful and efficient network of 200 food banks across the country. Through the support of private insurance, public funds, and the generosity of donors like the men of Lambda Chi Alpha, Feeding America offers accessible healthy food to families around the Ames community and around the country. Visit Feeding America for more information. Lambda Chi Alpha has adopted a section of Iowa Highway 30 west of Ames. The Chapter joins together several times a year to clean up the stretch of highway. This helps to keep the heavily traveled road clean and scenic for the people traveling through Iowa.